Oh how I love these two. There was a panda I wanted too but in the end I decided these two were true buddies and would live happily together. They look like a clever crime-fighting duo. I want to read about how the big guy uses his dapper spotted scarf to rescue his little friend during a reconnaissance mission gone awry. I have a teddy bear that my grandfather gave me when I was born. I’ve carried him with me for 52 years. His fur is worn off and he’s missing an eye. I always wondered what he originally looked like before I loved him so much. Now I know…..he is exactly like the larger bear pictured. My family always called him Bacteria Bear 🙂 I can’t “bear” to part with him. Great find! Lucky little bears! Wonderful! 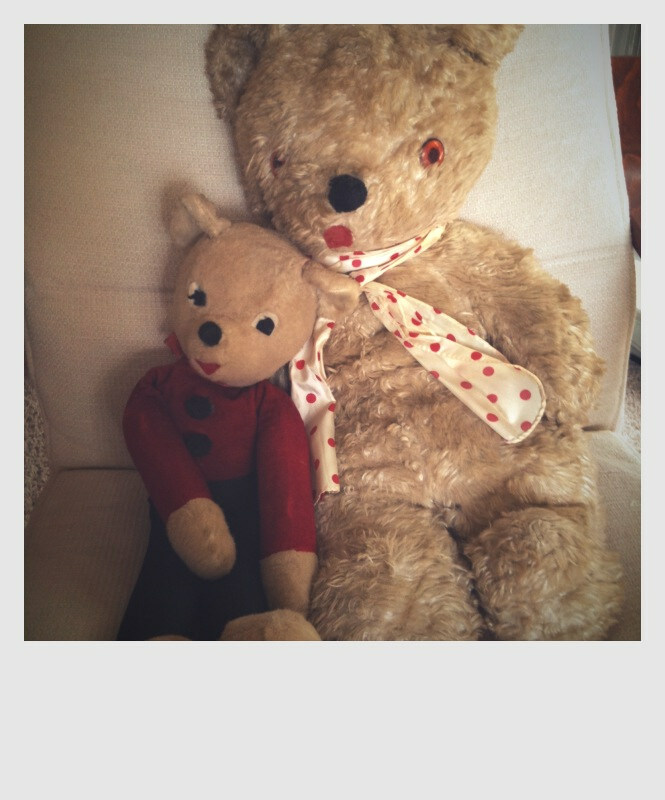 I’ve spent the past few weeks restoring my childhood teddy, which is exactly the same as the larger bear above! “Papa Bear’s” nose was chewed off by my family dog over 25 years ago and I couldn’t remember what kind of nose he originally had. Thanks!